Magitricity A NEW SHOW ABOUT ENERGY AND CLIMATE CHANGE! Debuting this winter at the Seasons of Change Exhibit at Yale’s Peabody Museum, MAGITRICITY began as a companion performance piece on energy and climate change. With its universal message of how humans affect environment and climate through energy use, it also shows the magic we can all do to reduce energy, create energy in cleaner ways, and save money and the planet at the same time. Littles Fairies, BIG MAGIC A NEW SHOW ABOUT PRESERVING OPEN SPACE! 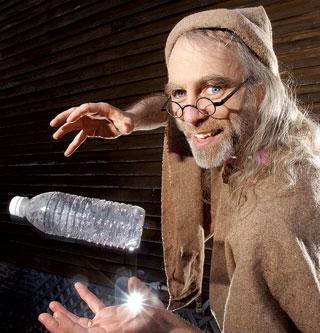 Cyril created this show after performing “Recycling is Magic” at a number of fairy festivals. He thought there should be a way to combine fairy tales with an important environmental message. In 2013 he debuted “Little Fairies, BIG MAGIC”, a storytelling and magic performance about a village beset by fairies and their humorous pranks. When the village wizard is called in to help, he suffers from their tricks as well. In the end, he learns why the fairies are so mad: the villagers were planning to cut down the rest of the forest, depriving fairies and animals of their homes. This story ends with the important message that just as humans need their own homes, we must protect the homes of wildlife as well. Secret of the Dusty Castle A NEW SHOW ABOUT LEAD POISONING AND AWARENESS! When asked to provide entertainment at the New Haven Health Department Lead Awareness event, Cyril siezed the opportunity to once again combine magic, story and education. “The Secret of the Dusty Castle” is a magical story of the birth of a princess, and the danger that was seen by the wizard for her future. The wizard explores all the likely dangers: dragons, ogres, goblins…but none seem to pose a threat. But the local witch tells him to look in the abandoned wing of the castle, the old lab of an alchemist. It turns out that the lead dust from the alchemist’s experiments remains there and has also blown into the princess’s nursery…. a danger of lead poisoning! Based upon information provided by lead awareness experts, this story delivers the important message of the dangers of lead to the audience that most needs to hear it: children and their parents. A wizard frees a village from a band of ogres only to be given the task of cleaning up the mess. He learns that making all the “trash” vanish won’t really help and, instead, recycles all that was destroyed into the new and useful. This short program ends with a discussion of the role children can play in making the magic of recycling happen in their own home, school and community. Invited to learn about the magical qualities of water by Cyril the Sorcerer at his “riverside laboratory”, the audience is swept up in the mission the wizard has been given by the king: find out why the river has become so polluted and shallow. Wizard and audience alike learn how rivers become polluted and overdrawn. The show features real world information on the hydrologic cycle, challenges facing modern society and ways in which we can all conserve and preserve “the magic of water”! Cyril dons modern clothes to share the magic of sustainability in the 21st century. Combining his decades of experience as an Ivy League environmental manager with spellbinding magic, he demonstrates how sustainability is the power of the 21st century. Cyril shows his audience how discarding “trash” as part of “waste management” has given way to recovering “resources” through recycling as a part of “sustainable materials management.” Cyril also offers amazing special effects and examples of sustainability transforming the fields of energy, manufacturing, water management and other arenas. For more on Cyril’s professional development programs visit www.betterworldmagic.com. In addition to his environmental magic Cyril also bring great enchantment and entertainment to his audiences through performances of a more traditional nature. Cyril weaves sorcery and storytelling for spellbinding shows. In this busking style show Cyril showcases the amazing cosmic powers he has encountered as a student of magic. From grand powers of Faith and Fate to the real world powers of Mind and Steel, Cyril brings amazing conjuring to this lively street magic style performance. In this series of stories evoking the legacy of Lord of the Rings and other fantasy masterpieces, Cyril shares the life of Jasper the wizard. Starting with his capture by goblins and mentoring in magic by imp and wizard, Jasper grows to play a role in the war between humans and goblins when he recovers the magical sword that began the conflict. Featuring swords, sorcery and epic adventure this cycle of stories provides an exciting visit to a world of legend. Cyril brings his own magic to a time of year known for its miracles: Hanukkah. Cyril shares magics featuring the luck of the dreidel, the glitter of gelt (gold coins and foil wrapped candy), the steel of the Brothers Maccabee, and the miracle of 8 days of oil. He also brings in some celebratory silliness to the event to make for a performance fun for all ages. Hello! I am so sorry for the delay in responding. I did not receive a notification from the website about yoru message. Please provide your phone number and/or email address so that I can communicate with you directly. THANK YOU!